Concrete is a very important material and present all around us, in concrete bridges, dams, buildings, and so on. Hence it is important to be able to model a concrete material adequately in finite element analyses. However, concrete is a most complex material to model in analysis. Many research efforts have been conducted on understanding the behavior of concrete, and numerous papers have been published on modeling concrete for numerical simulations. 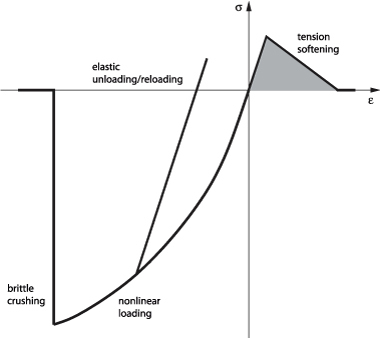 When subjected to very small stresses, the material behaves linearly, and elastically, but beyond certain threshold values, we observe cracking in tension, with thereafter tension softening, crushing in compression, and all in a highly nonlinear manner. This complex behavior of concrete must be represented in general nonlinear analyses, for example for structures under earthquake loading, or in accident conditions. To capture this behavior for analysis purposes, a microstructural representation shows most potential but such modeling of concrete is still not possible for large-scale structural analyses. Hence, many researchers have pursued a phenomenological approach in which the material behavior is represented by nonlinear stress-strain curves and failure surfaces that can be highly complex. In addition to having a model that represents the material behavior adequately, the finite element procedures to analyse concrete structures must be reliable and efficient. 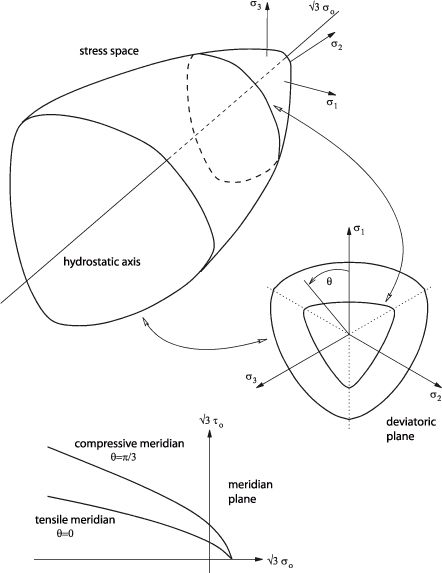 Since the solution response can be highly nonlinear, the iterative schemes used in static and implicit dynamic solutions must converge when cracking, crushing and softening of a finite element model occurs. There is probably no single concrete material model now available that can be universally applied, efficiently in practice, to model any concrete material and under any loading conditions (namely static, slow dynamic and fast dynamic conditions). The microstructure of concrete materials is too complex. Hence, until such model is available and finite element programs can use the model efficiently in practical large-scale analyses, it is appropriate to offer a number of concrete models in a computing environment. A powerful concrete material model has been available in ADINA for many years, and has been used widely in numerous applications, see Reference 1. However, as mentioned, since concrete is a complex material, there is need for other models. In particular, simple models that however capture the major characteristics of concrete behavior for certain analyses are very desirable. 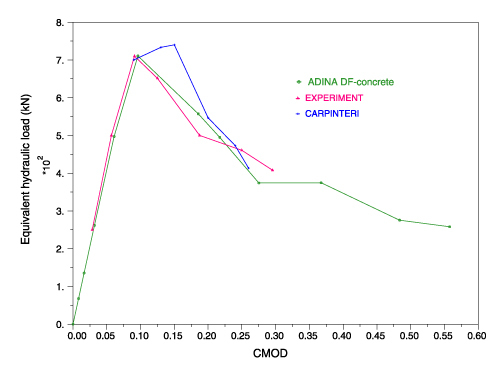 The additional ADINA concrete model now available is such a model, indeed only a single material parameter is to be input — the uniaxial compressive strength. a post-failure response for cracking based on a smeared crack approach that allows cracks to close and reopen. Since the model is, in essence, based on fitting laboratory test results, we refer to the model as the data fitted concrete model (or in short, DF-concrete model). The model is not applicable to any concrete structural analysis — and indeed is directed to static and low frequency dynamic conditions (as typically found in earthquake loadings) — but can be very simple to use and effective. Figure 3 shows a schematic of a gravity concrete dam analyzed by A. Carpinteri et. al. 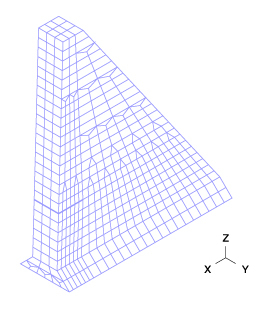 and Figure 4 gives the 3D finite element mesh representing the structure. 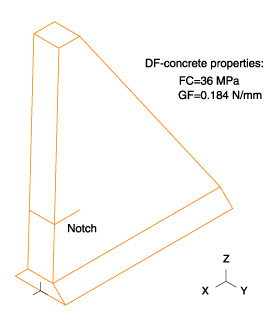 The calculated load-displacement response using the DF-concrete model is shown in Figure 5. Figure 5 also shows a comparison solution given in Reference 4. The ADINA DF-concrete model predicts the crack mouth opening displacement, CMOD, in good agreement with the experimental result. The movie below shows the propagation path of the cracks as the loading is increased. The movie at the top shows the development of cracks in a reinforced concrete beam solved with the DF-concrete model until its collapse. While the long-time available ADINA concrete material model has been amply used in many complex concrete structural analyses, this additional DF-concrete model will surely increase the applicability of ADINA in this very interesting and difficult field. K. J. Bathe, J. Walczak, A. Welch and N. Mistry, "Nonlinear analysis of concrete structures", Computers & Structures, 32(3/4):563-590, 1989. M. D. Kotsovos and M. N. Pavlović, Structural concrete: Finite-element analysis for limit-state design, Thomas Telford, London, 1995. M. D. Kotsovos and K. V. Spiliopoulos, "Modeling of crack closure for finite-element analysis of structural concrete", Computers & Structures, 69:383–398, 1998. A. Carpinteri, S. Valente, G. Ferrara and L. Imperato, "Experimental and numerical fracture modeling of a gravity dam", Proceedings of the First International Conference on Fracture Mechanics of Concrete Structures ed. Z. P. Bazant, 351-360, 1992.